New York (AFP) – International stocks rallied Wednesday following strong Chinese trade data and solid JPMorgan Chase earnings that lifted global banking shares. 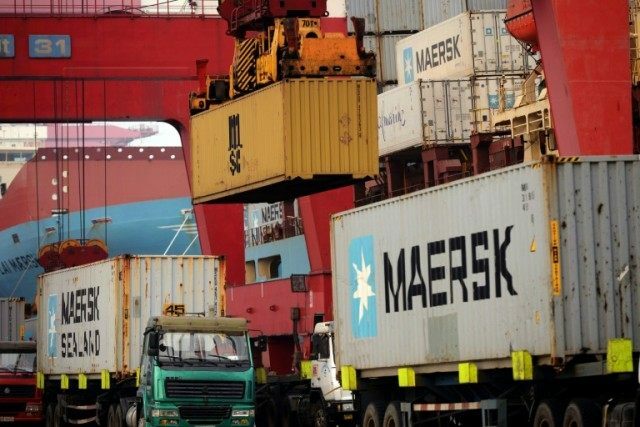 China said exports rocketed by 11.5 percent in March to $160.8 billion from a year earlier. That followed a 25 percent slump in February and marked the first gain in nine months. The strong data fueled hopes that a growth slowdown in the world’s biggest trader in goods and crucial pillar of global trade may be bottoming out. The trade data “add to growing evidence that the extreme gloom of a few weeks ago” about China’s economy was “misplaced”, economists at Capital Economics said. Sentiment was further boosted by earnings from JPMorgan Chase, the biggest US bank by assets. While JPMorgan reported a 6.7 percent decline in first-quarter earnings, the results still bested analyst expectations. JPMorgan executives said the US economy remains on solid footing and chief executive Jamie Dimon dismissed the prospects of a US recession in 2016. “The US economy continues to plug along, not as fast as we all want it to, but consumers are strong and companies still have plenty of cash,” Dimon said. Shanghai ended 1.4 percent higher and Hong Kong soared 3.2 percent, while Tokyo spiked 2.8 percent higher. Milan closed up more than four percent, Madrid and Paris rose by more than three percent, while Frankfurt gained 2.7 percent and London 1.9 percent. In the US, the S&P 500 climbed 1.0 percent. Oil prices fell roughly one percent but remained close to 2016 highs as traders weighed a jump in US crude inventories and a fall in US production. The dollar advanced despite data showing US retail sales tumbled 0.3 percent in March, prompting debate on whether the greenback has bottomed. “When the dollar moves higher despite such an abysmal report, market participants start to wonder if the softness of the US economy has been completely priced in and that the dollar’s downtrend is finally over,” said BK Asset Management analyst Kathy Lien. JPMorgan led the Dow, rising 4.2 percent, and was joined higher by other large banks. Bank of America and Wells Fargo gained 3.9 percent and 2.6 percent, respectively. All three were among the “too big to fail” US banks that came up short on a test by regulators to show how their bankruptcy would not threaten the broader financial system. The “living wills” requirement was enacted after the 2008 failure of Lehman Brothers threatened to bring down the financial system. The banks face potentially tough new capital requirements and other toughened rules if they are unable to file acceptable plans by October 1. However, the across-the-board gains of large US banks showed the market overlooked these concerns following JPMorgan’s results, where strong loan growth constitutes “a trend which bodes well for other US banks” that report later this week, said S&P Capital IQ analyst Erik Oja. European banks were also sky-bound, helped by the Italian government’s five-billion-euro ($5.7 billion) fund to recapitalize weakened Italian banks. Italian banking shares moved up across the board and were joined by rises in Britain’s Barclays, France’s BNP Paribas and Germany’s Commerzbank.